Several years ago I read a Georgette Heyer book with my in town book club. I don't recall enjoying it. In fact, I think I probably didn't. However, someone somewhere out there in book bloggy land read and reviewed A Civil Contract . It sounded like an interesting read and I marked it down as a "want to read at some point in the future." Fast forward until just a month or so ago when my friend (who had recommended the first Heyer book) mentioned that she was reading A Civil Contract . Aha! She owned a copy and she promptly agreed to lend it to me so that I could enjoy it as well. She assured me that I would enjoy this story and she was absolutely right about that! I found this to be an absolutely absorbing book. A Civil Contract tells the story of an arranged marriage between Jenny Chawleigh, daughter of a self-made financier, and Adam Deveril, a nobleman without a fortune. Jenny's father wants her to marry into a title and Adam finds himself with a practical need to marry for finances. The two had come into contact with one another through a mutual friend named Julia. Adam really wanted to marry Julia but without financial means to support her, Julia's father instead encouraged Adam to accept the arrangement proposed by Mr. Chawleigh. Jenny admires Adam but knows that he does not love her. Instead of asking for love, she spends her time studying to know him better and prove herself a credit towards him. While I didn't really care for the first Heyer book that I read, this one I had a hard time putting down. To be more truthful and blunt, I found the story so interesting and compelling that I resented every interruption that came my way. This is not a good attitude to have about a book when you are in the midst of a family. It's probably a really good thing that most books do not capture my attention in the same way or else I would be forced to quit reading entirely. I liked A Civil Contract for many reasons. Number one, it's very well written. I have been duly informed that Georgette Heyer is an expert on the time period she writes in. She apparently researched her books thoroughly and included many true tidbits from history into her stories. That made it fun reading because you know that when she is talking about something that the Prince Regent said or did, it really happened. Secondly, her characters are extremely believable. Not one person is over the top or jars you out of time and place. Thirdly, although this is a romantic story it is extraordinarily tame. No worries about scenes or language or anything sketchy which would set the conservative reader on edge. I could totally relax and follow the storyline without worry. Then too, I find the story more real than most that you read. Not all relationships (any?) are blissful through and through forever and ever amen. Nor are all struggles the volcanic type. Sometimes life is just a a quiet challenge, and we're all just trying to figure out how to get through and make as much of a success of things as possible. Such was the case with Jenny and Adam which makes them truly likable people. They have ideals and standards, but they also are honest about their weaknesses and have to work out their own boundaries. If you're looking for a fun book which takes a different look at relationship, check this one out. It's fascinating, educational and, again, just an easy good time. After this experience, I am no longer adverse to Georgette Heyer. I can very well see myself reading another of her works someday. Many thanks to my friend who lent it to me! Are you doing Tim Challies's reading challenge next year?? 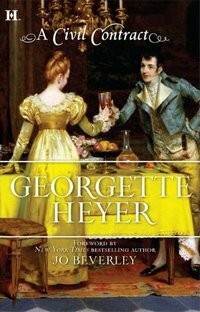 I have yet to read anything by Georgette Heyer. I keep seeing her books recommended, so I guess I need to pick one up soon! This one looks like a fun choice. Ok, I'm sold. I have a memory of totally disliking that first Heyer book too. But so many of my well read friends really Really REALLY like Heyer. I will give this one a shot. I've only read one Heyer book, and I haven't been keen to read another. Nothing wrong with the first one I read - it just wasn't a style I liked. But this does sound very interesting. I like the idea of a story about a married couple rather a typical "romance." Georgette Heyer is one of my favorite authors, for pretty much all the reasons you mention. You know the story will be clean, the characters seem real, and I love experiencing the Regency time period. I really enjoy the witty exchanges between the characters, too.